Gone to See the Caribbean Islands. Semester at Sea Spring 2010 Enrichment Voyage on the MV Explorer. Ultimate Travel Photography Workshop with Michael Mariant. Day 8: Port of Spain, Trinidad. Morning view of off-shore oil platforms from the deck of the MV Explorer. 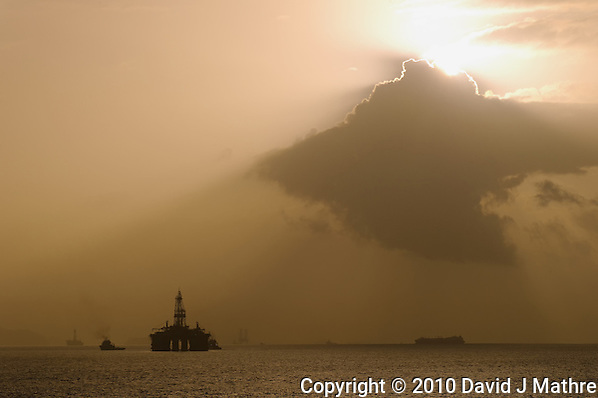 Morning View of Off-shore Oil Rigs. Port of Spain, Trinidad. Image taken with a Nikon D3s and 70-300 mm VR lens (ISO 200, 135 mm, f/16, 1/1000 sec). Raw Image processed with DxO, Capture One 6 Pro, Nik Define, and Photoshop CS5.